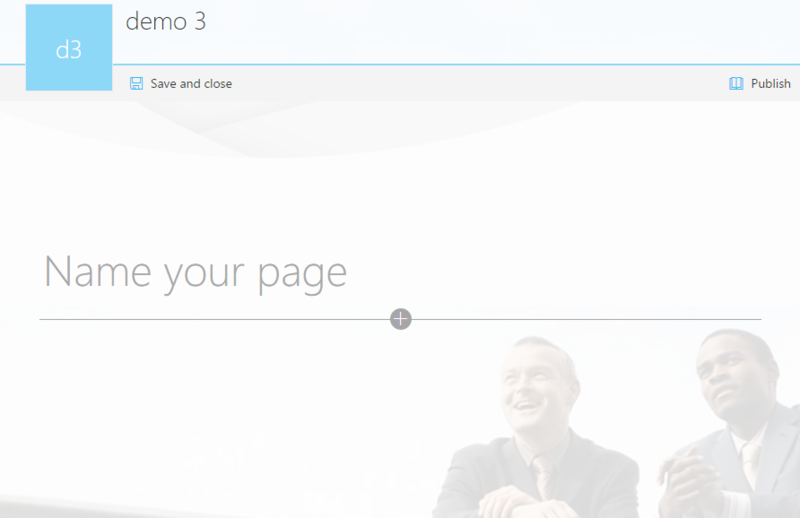 In 2016, the "modern" page experience was released by the SharePoint team. Modern team site pages are fast, easy to author, and support rich multimedia content. Additionally, pages look great on any device, in a browser, or from within the SharePoint mobile app. SharePoint pages are built with web parts, which you can customize according to your needs. You can add documents, videos, images, site activities, Yammer feeds, and more. Just select the + sign and pick a web part from the toolbox to add content to your page. The new “highlighted content” web part lets you set criteria so that specific content automatically and dynamically populates in that area of the page. By using the SharePoint Framework, developers can build custom web parts that show up right in the toolbox. This article focuses on the extensibility options within the "modern" page experience. However, if you want to learn more about the functionalities offered by the "modern" experiences, see New capabilities in SharePoint Online team sites including integration with Office 365 Groups. In the remainder of this article, we'll use "modern" for the new user experience and "classic" for the legacy user experience. We're not deprecating the "classic" experience; both "classic" and "modern" will coexist. We don't recommend combining "modern" page functionality with "classic" SharePoint publishing portals. By default, the "modern" page functionality is not enabled on "classic" SharePoint publishing portals. In June 2017, SharePoint Framework Extensions went into developer preview. Using these SharePoint Framework Extensions, you can control the rendering of a field via custom code, and you can create user custom actions that execute your custom code. To learn more, see Overview of SharePoint Framework Extensions. In May 2017, during the SharePoint Virtual Summit, we announced communication sites with configurable page layouts. If your site happens to use a custom theme, this theme is respected in the "modern" page experience as shown in the following sample. The "modern" pages are delivered by using the Site Pages web scoped feature (B6917CB1-93A0-4B97-A84D-7CF49975D4EC), so when this feature is activated, your site has the option to use "modern" pages. When Microsoft rolled out this feature, we enabled this for all "modern" team sites (GROUP#0 sites) and for most "classic" team sites (STS#0). If a "classic" team site had a high count of web parts or wiki pages, the feature was not automatically enabled, and the same applies to "classic" team sites with the publishing feature enabled. If you want "modern" page functionality on these sites, you can still activate the Site Pages feature. This also implies that sites based on other templates do not have the "modern" pages functionality enabled. The previous paragraph talked about how the "modern" page feature was enabled on existing sites. When you create a new "modern" or "classic" team site (GROUP#0 or STS#0), the "modern" Site Pages feature is enabled at provisioning time. The "modern" Site Pages feature is not enabled on sites that are based on other templates. You have multiple options to control whether the "modern" or "classic" page experience is used. If you want to completely disable the "modern" experience, it's best to use the tenant setting for this. Go to your tenant admin center (for example, contoso-admin.sharepoint.com), go to Settings, and select the "classic" experience. The tenant level setting can be a little confusing; Prevent users from creating Site Pages actually brings back the "classic" experience. The current configuration is cached, and signing off the session immediately shows the effect of this change. You can prevent a web from using the "modern" page experience by disabling the web scoped feature with ID B6917CB1-93A0-4B97-A84D-7CF49975D4EC (name = "Site Pages"). To re-enable the "modern" page experience at the web level, you need to activate the feature again. When you disable the feature, you can no longer create new "modern" pages, but the already created pages stay working using the "modern" user experience. By default, users can add comments (July 2017) on "modern" pages. If your organization does not want this feature, it can be disabled from the tenant Admin center on the Settings page. As of September 2017, pages created using the AddTemplateFile method do not have a preview when you hover over them from the search results page. Microsoft is working on a fix/alternative solution for this. As of the March 2017 release, the PnP Sites core library offers support for creating, updating, and deleting client-side pages. This section gives you information about how to work with client-side pages using the PnP Sites core library on GitHub. In this sample, we create a new client-side page in memory, add a rich text editor control, and finally save the page to the site pages library as mypage.aspx. The first step is creating a ClientSidePage instance, and then we instantiate a control that we add on the page by using the AddControl method. After that's done, the page is saved. When you want to modify or copy an existing page, you can load that page into the PnP client-side object model; the loading "transforms" the HTML content into an object model that you can manipulate. Loading an existing page is done by using the Load method. // load the page with name "page3.aspx"
Pages can have a flexible layout; you can add one or more sections on a page, and these sections can have up to three columns. You can add sections to your pages by using the SharePoint user interface, or you can do this programmatically. The following sample shows how you can add an out-of-the-box image client-side web part on a page. Note that we instantiate the web part object by using the InstantiateDefaultWebPart method call. After the web part is initiated, its properties are set to the default properties defined in the web part manifest. For most web parts, you need to update the properties as shown in this sample. Previous samples showed how to work with out-of-the-box web parts, but you can also add your custom built client-side web parts to a page. You would start by getting your web part information by using the AvailableClientSideComponents method, and then search for your web part and use the information you find to instantiate a ClientSideWebPart instance, which is added to the page in the last step. You have different methods to control the order in which the controls appear on the page. The key aspect is the Order attribute on the actual control: the list of controls is sorted by the value of that Order attribute when the page HTML is generated, and the order in the HTML is also the order at page rendering time. If you want to delete a control from a page, you can simply call the Delete method on the control and save the page back. Finally, you can delete a client-side page. 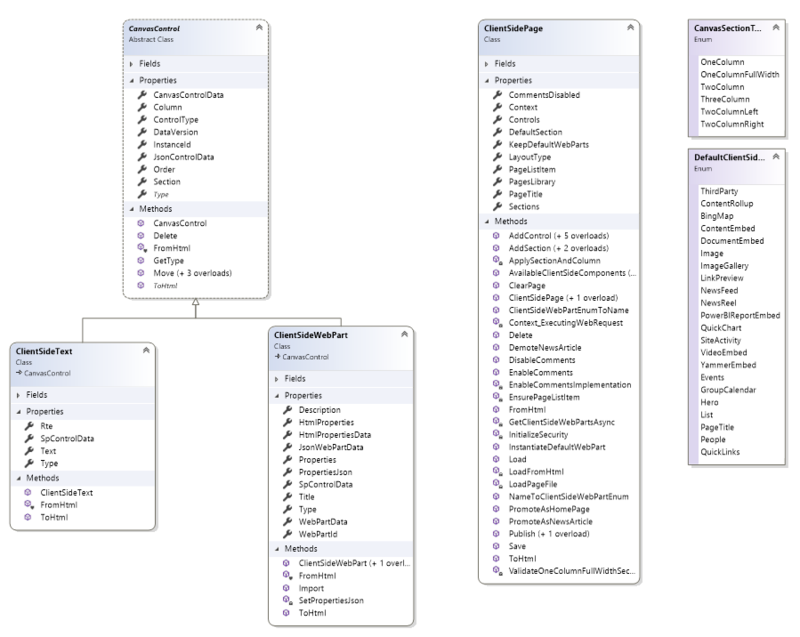 The following figure shows the most important classes you'll be working with when using the PnP client-side page object model. We'll gradually introduce more customization options for the "modern" pages experience. These options will be aligned with the release of additional SharePoint Framework capabilities. Currently, there is no exact schedule available, but we'll update the "modern" experience articles whenever new capabilities are released.